Wave Break, inspired by the most famous wave of all- The Great Wave off Kanagawa by Katsushika Hokusai. This ocean art pendant captures the ocean at it's most mysterious. A sudden wave of fortune out of nowhere- shall it overwhelm us, or sweep us along to joy untold? Hand forged in Argentium Silver, Wave Break measures approximately 1.5 inches tall, and features a lovely tear cut white Topaz. 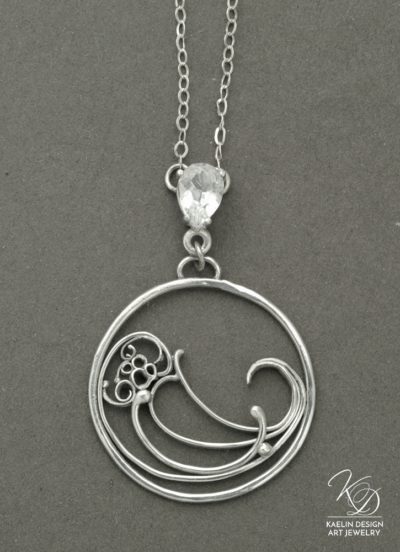 This one of a kind pendant is designed with a fixed chain length to help it alway lay properly. Please select your desired chain length to purchase this pendant.